Now this is how you tear a room up with an entrance. This amazing, over-the-top scene comes from CEO 2015, a fighting game tournament held last weekend in Orlando, Florida. The player making the wrestling entrance is none other than Kenneth Bradley, a Marvel vs Capcom entrant who gave fans a little show before the start of a semi-final match last weekend. 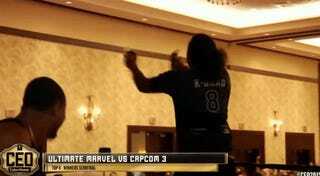 According to Shoryuken, Bradley was not able to advance in the tournament...but with an entrance like that, who cares?